I've been getting pretty mooshy lately while talking about blogging friends - so I thought I'd stay on the mooshy train and talk about another friend - Melissa from Lacquer Reverie. I have raved about her blog on Facebook so many times because her posts are so fun to read. She is so witty and I love witty people. She is a new blogger; but has grown very quickly, and I am so proud of her. Melissa was kind enough to surprised me with a gorgeous polish. This is Layla Ceramic Effect CE52. It is also known as "The Butterfly Effect". Isn't it beautiful? I love it so much. As you can see, it's a flaky polish that shows sparks of orange, yellow, red, green, and a little blue. The flakies are suspended in a purple jelly base, so I thought I would layer it over a color that matches the base....Zoya Yasmeen. I believe Melissa found this at Ulta. She showed another Layla in her post here and I was surprised when she mentioned she found it at Ulta. With Ulta being my second home, it surprises me that I have never seen them. You better believe I will be looking for them next time I'm there. I was so impressed with this polish....I only used one coat over two coats of Yasmeen. Yasmeen is such a beautiful purple. 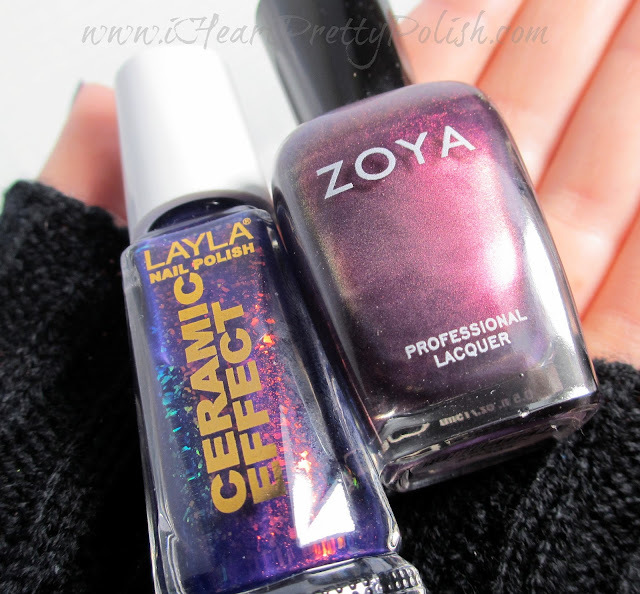 Here is how Zoya describes it: "dark blue-toned purple base with very strong red-toned medium purple shimmer and hints of gold duochrome." It's a must have Zoya, in my opinion. Gorgeous! I have this sitting sadly in my untrieds. Well you better change that real quick! This polish has been on and off my wishlist so many times... I think this post has cemented it's spot back on. :) I have polished like that. I take them off when I go through and clean-up my wish list and then when I see a new post, it goes back on. I also see posts and then go to put a polish on my list and it's already there...now that's a sign! Wow...this looks fantastic on you! It's SO shiny! I gotta try mine out. And what a beautifully sweet post! :) Thank you. Can't wait to see your swatches and what you have to say about it:) Thanks again! Thank you so much:) Blogger Friends are the BEST! Butterfly Effect is a great Layla polish and it looks wonderful on you! The Layla Ceramic polish in black is definitely my go-to black polish for a few months now, so that is one Layla polish I can recommend. Don't feel out of place. The only way I have met people is through emailing and FB groups. Just shoot me an email any time...I love getting to know new nail bloggers/polish lovers. Welcome to the community! This looks stunning!!! I love it! !